The landmark study of atrial fibrillation compared the catheter procedure with medication. 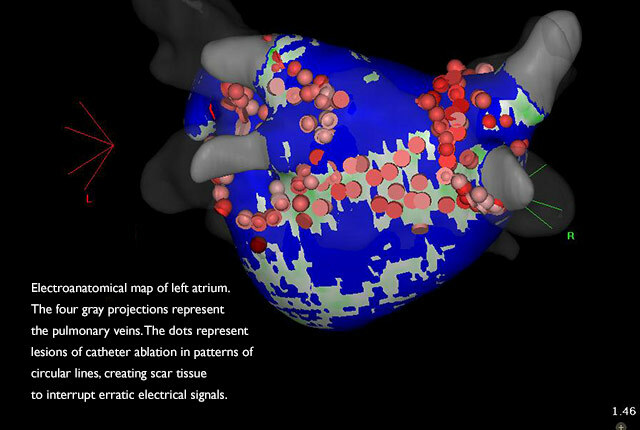 A map of a patient's ablation procedure. Catheter ablation is a minimally invasive procedure in which areas of vessels are purposely deadened so they cannot conduct erratic electrical currents within the heart. The new research, published in JAMA, associated the procedure with a significant improvement in quality of life and a reduced need for hospitalizations, compared with drug therapy. Notably, however, in the trial's primary measure – rates of death, disabling stroke, serious bleeding and cardiac arrest – ablation was not statistically more effective than drug therapy. These are the first results reported from the landmark Catheter Ablation Versus Antiarrhythmic Drug Therapy for Atrial Fibrillation (CABANA) trial. It is the largest such clinical trial comparing the two treatments to alleviate atrial fibrillation. Jeanne Poole, professor of medicine at the University of Washington School of Medicine, led the research team's investigation of recurrent arrhythmias, a subset of the findings. Atrial fibrillation, or “A-fib,” is a common heart rhythm irregularity in which the top chambers of the heart (the atria, which act as priming pumps for the heart) beat ineffectively and sometimes quite rapidly. Symptoms can emerge without warning; most commonly they involve palpitations, fatigue and shortness of breath. A-fib increases a person’s risk of stroke, heart failure, and other serious health conditions. It is estimated that over 30 million people suffer from A-fib worldwide. While catheter ablation’s benefits were clear in terms of heart-rhythm regularity, symptoms and quality of life, its effect on the risk of death, stroke, major bleeding and cardiac arrest was less so. The primary comparison between catheter ablation and drug therapy showed a 14 percent lower risk of these “hard endpoint” events with ablation, but the difference was not statistically significant by conventional interpretive benchmarks (intention to treat). Importantly, catheter ablation was not associated with worsening of these outcomes. Data analysis showed ablation was not statistically more effective than drug therapy at reducing rates of death, disabling stroke, serious bleeding or cardiac arrest – but almost 10 percent of the patients assigned to ablation did not receive the procedure and almost 30 percent of the drug therapy group underwent an ablation during follow-up. These crossovers, complicate interpretation, said Douglas Packer, a trial principal investigator and professor of medicine at Mayo Clinic in Minnesota. Patients were enrolled in the CABANA trial at 126 centers in 10 countries. Each patient had new onset (within a year or less) or under-treated paroxysmal, persistent, or longstanding persistent atrial fibrillation. Patients with the most severe quality-of-life impairments at time of enrollment showed significantly greater improvement after catheter ablation than patients with initially mild symptoms. A separate study, published in parallel in the European Heart Journal, replicated the CABANA trial in reviewing a much larger population of patients who had received either ablation or medication alone, including patients who would have been excluded from CABANA. The researchers found that ablation was associated with a lower likelihood of patients experiencing one or more of the most serious outcomes: all-cause mortality, stroke, major bleeding and cardiac arrest -- although the benefit associated with ablation was smaller in patients who would have been excluded from the trial.